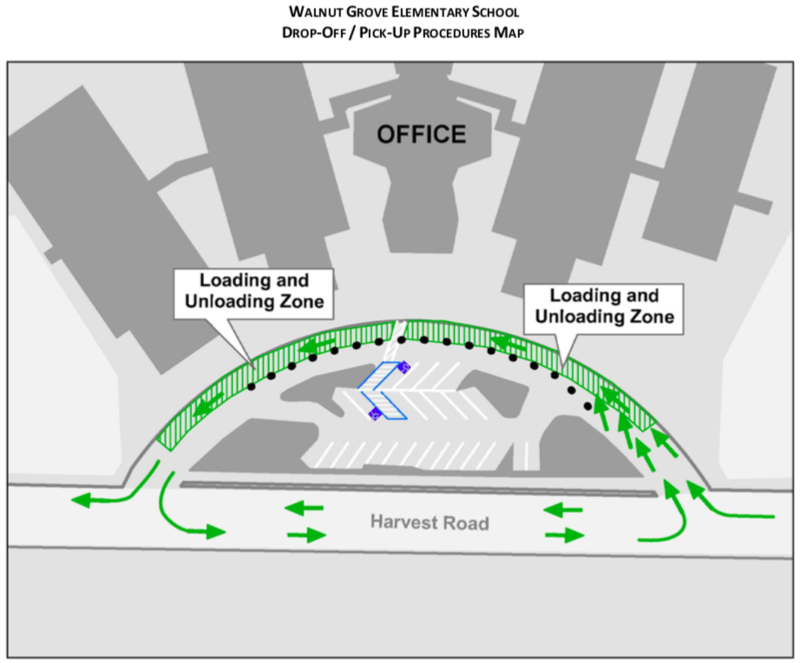 We have been working with the City of Pleasanton to improve safety associated with the drop-off and pick-up of students at Walnut Grove Elementary School. Our joint efforts are part of “Rides to School,” Pleasanton's School Traffic Calming Program. The primary unloading/loading area is within the parking lot; refer to the circulation map located on the back. Vehicles enter the one-way loop from Harvest Road. There are two lanes upon entering the drop-off loop; once in the loop, vehicles will be merged into one lane along the curb. Vehicles are asked to continue to move forward to the front of the line to allow the maximum number of cars in the loading zone prior to students entering or exiting the vehicle. The curbside lane is the only lane upon which students should be dropped off or picked up. The Safety Valet Patrol will assist students in and out of their vehicles to help expedite the process. Parents are asked to stay in their vehicles at all times to minimize the time in the loading zone. Upon exiting, vehicles will be able to make a left or right turn onto Harvest Road. The north parking lot by the 100 building is not for drop off or pick up. Parents wishing to park their vehicle and walk their child in may do so in the available parking on-street or in the adjacent parking lot. School visitors must adhere to posted loading zone and parking restrictions at all times.